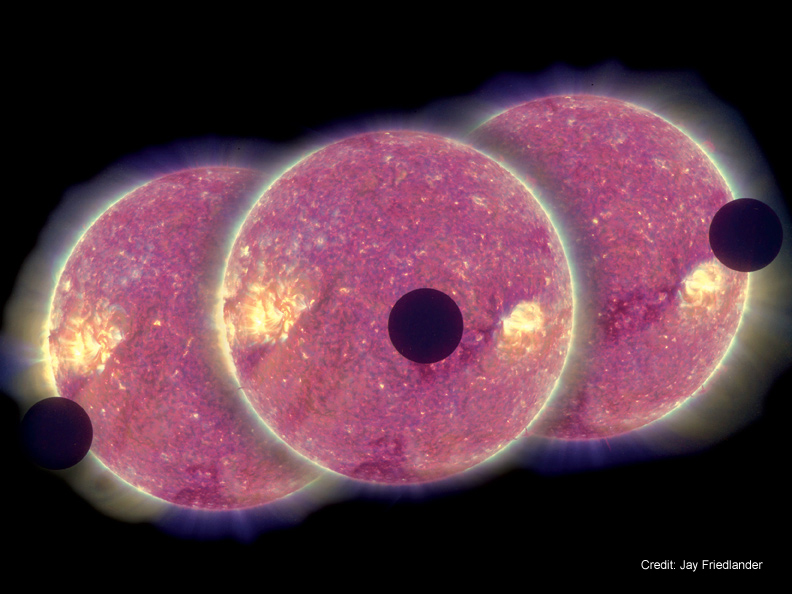 Flares happen when the powerful magnetic fields in and around the sun reconnect. They're usually associated with active regions, often seen as sun spots, where the magnetic fields are strongest. Flares are classified according to their strength. The smallest ones are B-class, followed by C, M and X, the largest. Similar to the Richter scale for earthquakes, each letter represents a ten-fold increase in energy output. So an X is 10 times an M and 100 times a C. Within each letter class, there is a finer scale from 1 to 9. C-class flares are too weak to noticeably affect Earth. M-class flares can cause brief radio blackouts at the poles and minor radiation storms that might endanger astronauts. Although X is the last letter, there are flares more than 10 times the power of an X1, so X-class flares can go higher than 9. The most powerful flare on record was in 2003, during the last solar maximum. It was so powerful that it overloaded the sensors measuring it. They cut-out at X28. A powerful X-class flare like that can create long lasting radiation storms, which can harm satellites and even give airline passengers, flying near the poles, small radiation doses. X flares also have the potential to create global transmission problems and world-wide blackouts. Note: The Februari 15 2011 and the March 9 2011 were earth directed, the August 9 2011 and the December 14 2006 of Solar Cycle 23 were not earth directed. Would you like to take a quick Sun/Solar Test and feel like a real solar scientist? A transit occurs when a celestial body crosses the meridian due to the Earth's rotation, about halfway between rising and setting. For instance, the Sun transits the meridian at solar noon . Observation of meridian transits was once very important for timekeeping purposes (see transit instrument ). Known natural objects which can appear between the Earth and the Sun are the Moon (solar eclipse), Mercury (transit of Mercury), Venus (transit of Venus), and some asteroids and comets. Transit of asteroids and comets can only be observed by very large telescopes. For example all attempts to watch the transit of Comet Halley in front of the sun in 1910 failed as result of its small diameter. All such transits can be calculated very well. A lunar eclipse occurs when the Moon passes behind the Earth so that the Earth blocks the Sun 's rays from striking the Moon. This can occur only when the Sun, Earth, and Moon are aligned exactly, or very closely so, with the Earth in the middle. Hence, a lunar eclipse can only occur the night of a full moon . The transit of Mercury occurs when the planet Mercury passes between the Sun and the Earth. Many of you will have seen the varied claims that are made about imagery from the STEREO satellites - it can't be Venus, it must be a comet, it's releasing a CME, it's Nibiru... you may even have seen other videos debunking those claims - debunkings that takes absolutely no time at all. This video shows over 7000 images from STEREO-B's HI1 instrument taken since January 1st 2010, and over the course of the seven months we get to see a selection of reflections, diffractions, corrupted imagery, spacecraft rolls, distant stars, the milky way... everything can be easily explained within this imagery, so sit back and chill out - you might learn a thing or two. If you want to learn more about the STEREO imagery there are some key links to get you started listed below. If there ever comes a time when something truly strange is spotted in STEREO imagery, these links will know about it before YouTube, but until that day - if it ever arrives - enjoy STEREO for what it does show. The images are shown in the order of the relative positions of the viewpoints, Behind, Earth, and Ahead. 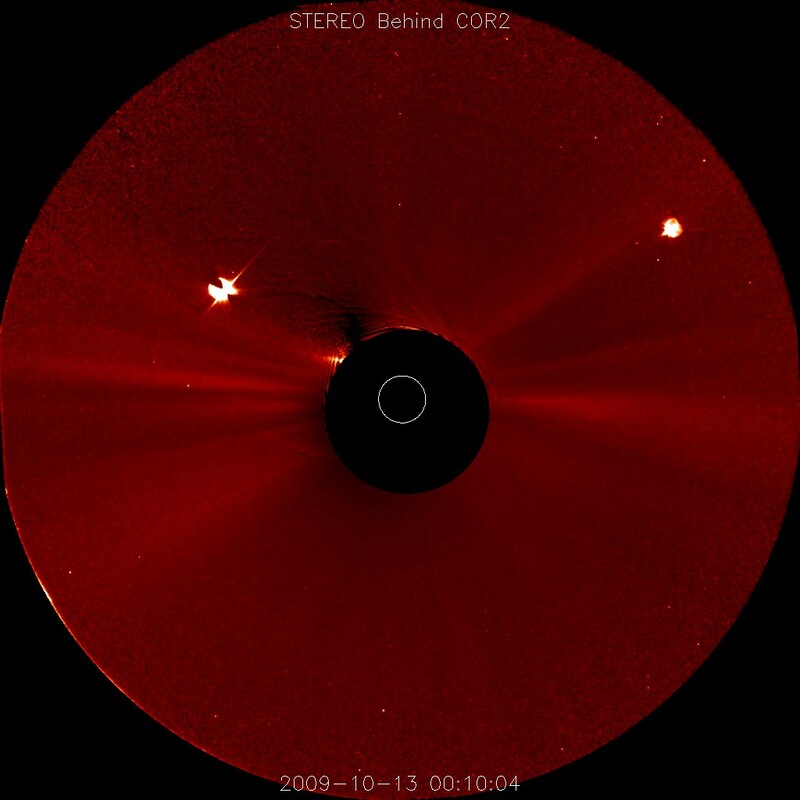 For the Heliospheric Imager (HI) images below, the order is reversed to reflect the fact that the HI Ahead telescopes look to the left of the Sun, and those on Behind look to the right. 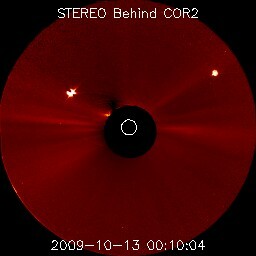 Also, the HI images are not rotated to put solar north up. 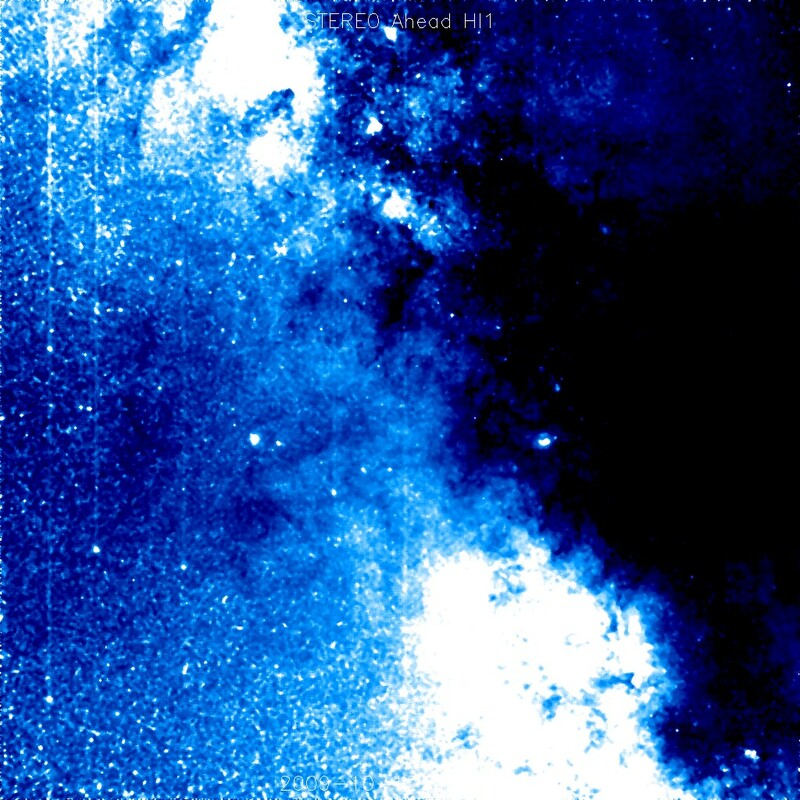 The Milky Way passing through the field-of-view of the STEREO Ahead HI1 telescope on October 12, 2009. Bokeh: a source of circles around out-of-focus bright points, also due in part to the internals of the lens. 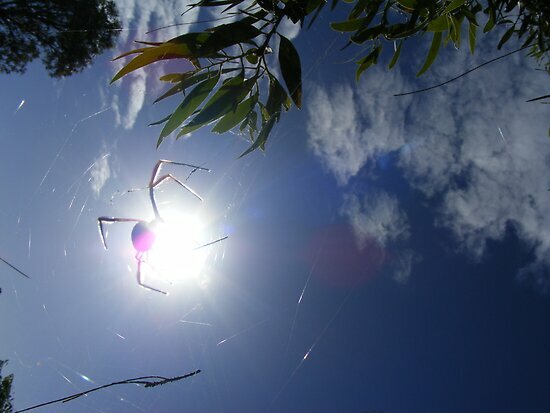 What causes the sun to appear as a black dot when I take a digital photo? 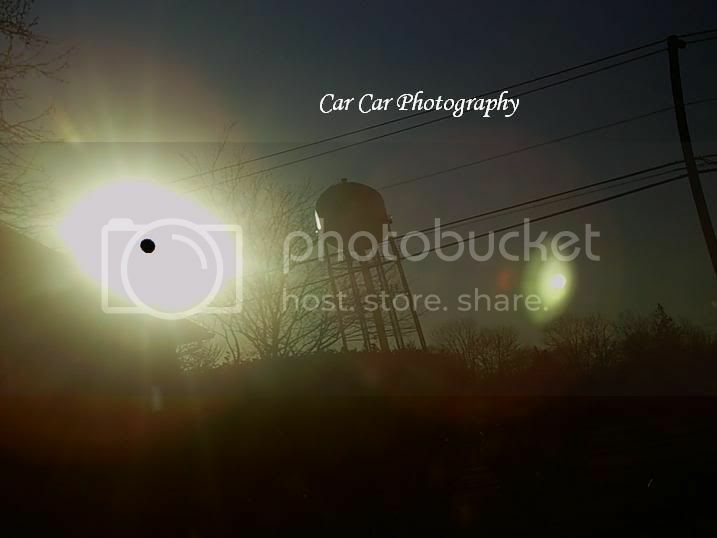 Sun dogs: A sun dog or sundog is an atmospheric phenomenon that creates bright spots of light in the sky, often on a luminous ring or halo on either side of the sun. 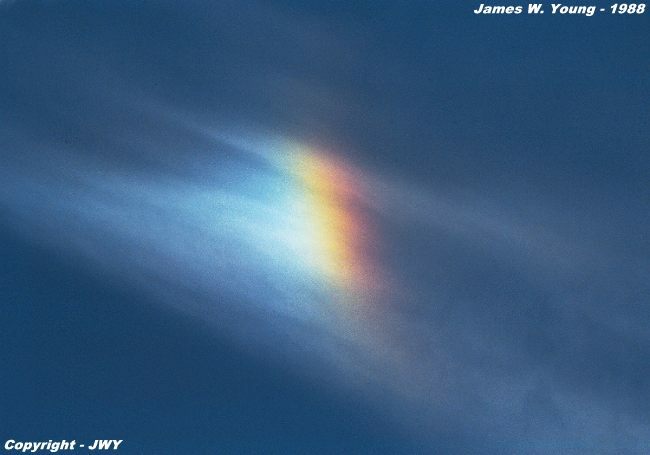 Sundogs may appear as a colored patch of light to the left or right of the sun, 22° distant and at the same distance above the horizon as the sun, and in ice halos. They can be seen anywhere in the world during any season, but they are not always obvious or bright. 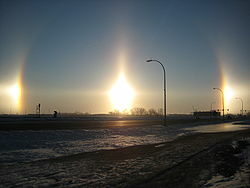 Sundogs are best seen and are most conspicuous when the sun is low. What is field rotation? How does it affect my scope's viewing and imaging? Field rotation is the apparent rotation of a celestial object in the field of view of a telescope during the course of the night. All objects in the eyepiece field or on the camera's image will move in arcs. It's usually either ignored or not noticed for visual observations, but cannot be ignored for photography. It happens when you are using an altazimuth mount or a misaligned equatorial mount. In these cases, all the stars will appear to move around the point or star that is being tracked. Field rotation will occur unless the mount is exactly aligned to counteract the earth's rotation. Field rotation can be visualized by thinking about what happens when a constellation or the moon rises, transits and sets. From northern latitudes, Orion will rise on his side with his left shoulder (the one north of Rigel) highest. As he crosses the sky he will reach and transit the meridian, when both shoulders will be the same height. When he sets, the right shoulder (Betelgeuse) will appear highest. It's like he's climbed the dome of the sky, reaching the top and then goes down the other side. The angle of his body changes during the course of the night, first tilting to the east, then tilting to the west. Similarly, the moon will rise with the Sea of Crises (Mare Crisium) edge leading upwards, the Ocean of Storms (Oceanus Procellarum) following and lower. Both of these dark areas will appear about the same altitude when it transits, then the Ocean of Storms will be higher than the Sea of Crises as the moon sets. 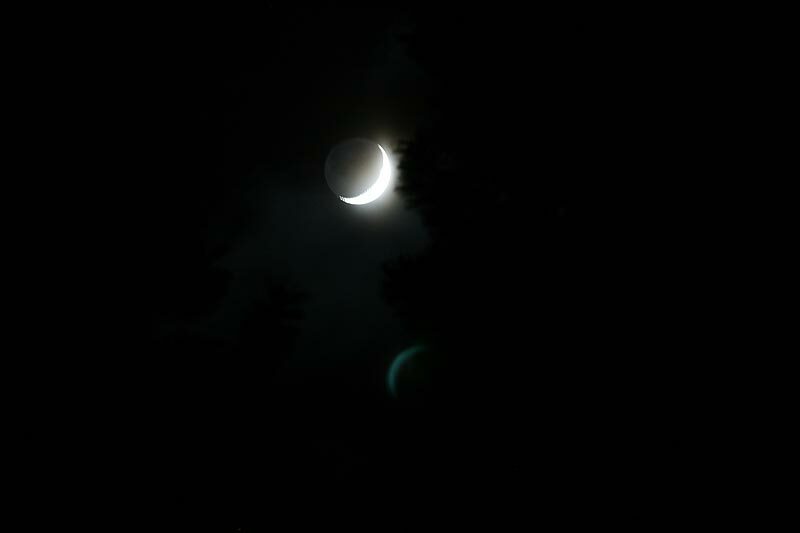 Again the tilt changes as the moon moves across the sky. Both examples show field rotation with your head and body acting like an altazimuth mount. Because of field rotation, visual directions north, south, west and east will change relative to the top and bottom of the eyepiece during the night. Usually this is not important but you should be aware of it. On photos, even if tracking on a star is perfect, unless the mount itself is perfectly polar aligned, there will be some degree of field rotation. Only the center will show pinpoint stars or sharp detail. Towards the edge of the field of view, all stars will show arcs concentric with the center. If you are guiding a photograph and using a star off-center or outside the field of view for guiding, then the arcs will be concentric on the guide star. Because of field rotation, no altazimuth mount is suitable for long-exposure astrophotography. Only a properly polar-aligned equatorial mount will eliminate field rotation. Here is a video simulation of the sky around the constellation Cassiopeia, from about 5 PM to 10 PM on a December evening. Each frame represents 15 minutes of elapsed time. You can see the constellation slowly moving across the sky, rotating around Polaris, at the North Celestial Pole. The animations on this page use "animated gif" graphics. 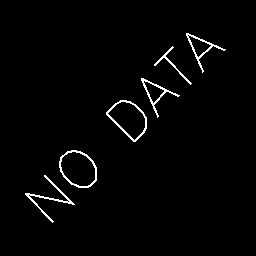 If you are not seeing moving pictures, make sure that your browser settings have not disabled animated gif graphics. This is a good quality fork mount, well-aligned, and it is tracking the central star in Cassiopeia perfectly. Notice how the central star stays perfectly centred in the frame all night. Observe Cassiopeia in the frame closely. Although the central star remains perfectly centred, you can see that the rest of the constellation is rotating around it as this very long exposure progresses. Let's make that easier to see. Here we zoom in on the camera frame. This is exactly the same video - nothing is changed, except that we are seeing only what the camera sees. The fork mount is doing its job perfectly - the centre star in our target is remaining perfectly centred. However, because the sky is rotating and the camera is not, the other stars in the frame are rotating as this long exposure proceeds. If we were taking a long-exposure photograph, the centre star would be perfect, but all the other stars would show up as circular arcs. The longer the exposure, the longer the arcs would be. An equatorial mount doesn't suffer from field rotation, assuming it is properly polar-aligned. This applies to any equatorial mount, including traditional equatorial mounts like the one shown here, and fork mounts on equatorial wedges. This is because when an equatorial mount tracks an object across the sky, the telescope does not remain horizontal, the tube rotates. Observe this equatorially-mounted telescope closely, and note how the "top" of the tube changes as the scope moves across the sky. Here is our camera field simulation again. This time, however, the camera is on a telescope on an equatorial mount. Note how the frame of the camera rotates as the target is tracked across the sky. Now, note that all the stars of our target are remaining in the same relative position inside the rotating camera frame. From the camera's point of view, the target is not rotating at all, and all of the stars will come out perfectly in a long exposure. 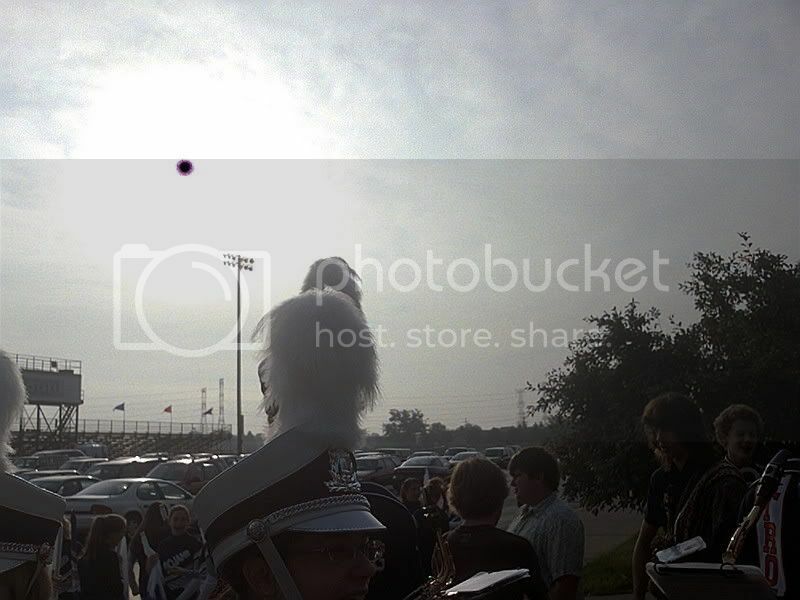 Its like the sun comes up and goes down in a different place than usual, how can this be? Note: When you check your compass you will see that North now points East. Image artifacts - Internal reflections: Light reflecting inside the telescope optics, and diffracting off edges within the telescopes, can produce some interesting effects. 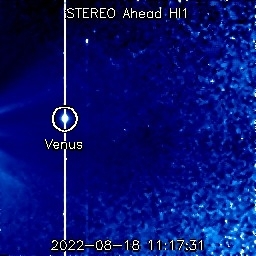 Consider this series of images showing the planet Venus leaving the field of view of the HI1-B telescope betwee n Janary 26-31, 2009. As Venus approaches the edge of the field-of-view, a ring shape is seen apparently coming out of the planet. This is caused by reflections of the bright planet off of the camera barrel. 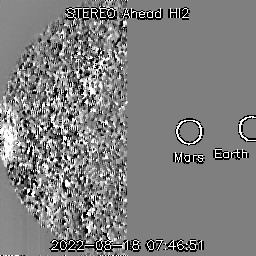 (If you look closely at the full-field version of the January 26, 2009 image above, you'll see a large, faint bubble on the left side of the image, which is also an internal reflection of Venus.) The ring grows progressively larger as time goes by. On January 31, a horizontal streak appears near the position where Venus disappeared. This latter effect is caused by diffraction off of the optical baffles.